Here are pictures from the scene of fire outbreak which occurred this morning in the heavily populated Abule Egba, area of Lagos State when a spillage from a fuel tanker that was siphoning petrol from a vandalized pipeline suddenly burst into inferno, razing several houses and vehicles in the process. Fortunately, there was no life loss, according to Lagos State Emergency Management Agency, LASEMA, who responded to the distress call. It was gathered that residents were scooping fuel from the spillage and in the process there was a spark which resulted into inferno, consuming everything along it’s path. However, another version of the report had it that the fire resulted from the activities of bunkerers who were scooping fuel from a vandalised petroleum pipeline in the area. 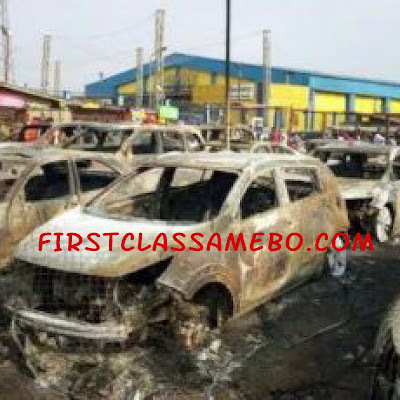 Eyewitness narrated that the response of emergency officials prevented the fire from spreading to a petrol filling station close to the scene of the incident. Other rescue team that responded include: Men of the Lagos State Fire Service, state Police Command, Federal Road Safety Corps, Lagos State Traffic Management Authority, LASTMA, Lagos State Emergency Ambulance Service, LASEMBUS, among other responders. Emergency and rescue team are still at scene to fully ensure restoration of complete normalcy in the area while traffic managers were busy controlling the chaotic traffic jam in the area.